Spillz by Kwalee has been around for quite some time but still worths the bother of giving it a decent game guide walkthrough and review. 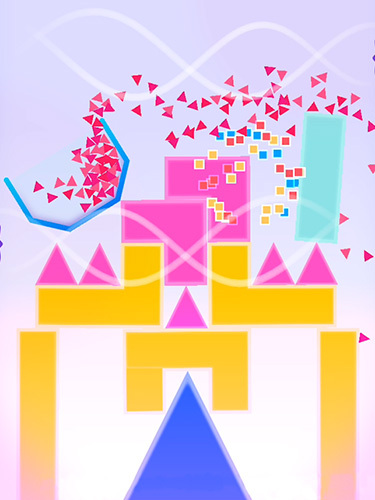 Spillz is a hilarious and outrageously fun puzzle game in where the player has to remove the piled up blocks in order to send the container crashing to the ground. The whole purpose of the game lies in the aim to not move too quickly in order not to risk spilling the given balls of each level. As you try to keep 100 balls inside the bowl you’ll meet many obstacles that will continuously try to spill everything out. Basically, the aim is to get as much of the contents of the bowl as possible from the top of the screen to the bottom of it. Which you’ll achieve by removing differently-shaped blocks one by one while keeping the bowl aloft. If you remove a certain wrong shape, the bowl will tilt and spill the balls that’s carrying ending thus your round. After failing there are no restrictions to keep you waiting but you can start over as fast as you want. As soon as you see things starting to go wrong with just a swift tap you’ll be back to the beginning. In Spillz there are two main modes that you can choose to play. In endless mode you can see how far you can fall before losing all your balls. Meanwhile in challenge mode, the more balls your container will have once you reach the indicated bottom, the more start you’ll be earning. But in both modes once you get to the bottom of the platform safely, you can advance to the next level. Spillz genuinely stands out as very addictive and very challenging while producing a lot of fun in the meantime. As expected for games of this kind, the further the level you reach, the more difficult it gets to advance through. There’s an exciting number of levels and a lot of physical effects included. Watching balls spills never seemed so fun.